This will be an ongoing page that I will update as I make more progress. A Cipher Games Puzzles ? 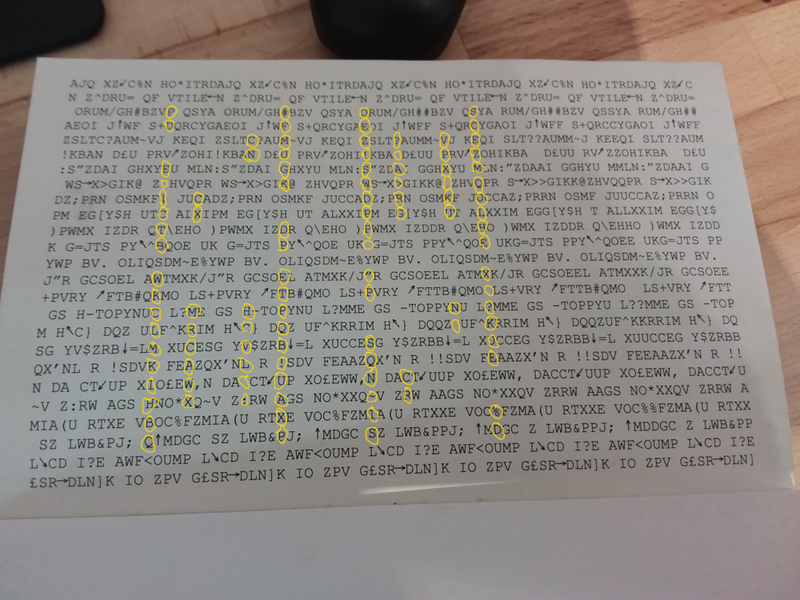 This is a substitution cipher and the title text was hinted at in bold on the page before. The penguins in space helmets denote spaces. Decoding the penguins in the picture we get the letters and spaces to make NINETEEN EIGHTY EIGHT. The missing words are Copy, Right and Page. There are some lists which are odd ones out. b(y)ellow, d(y)awning, f(y)east, f(y)ield, h(y)elped, l(y)earning, m(y)odel, m(y)outhful, p(y)onder, PUZZLE, Words which can exchange their first letter for a Y.
delPHI, macrobIOTA, mariaCHI, MULTIPLY, parveNU, pePSI, scamPI, taXI, taffETA, Words ending in greek letters. 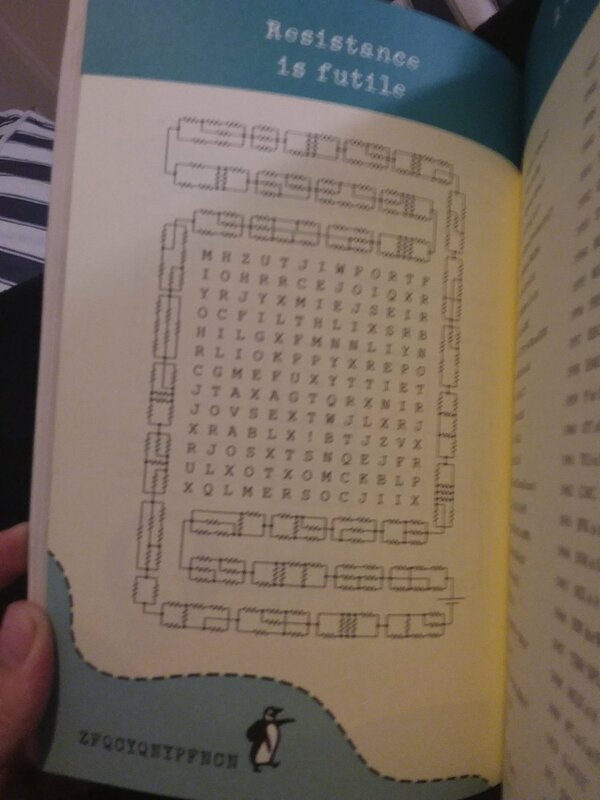 So we have to go to the Penguin Puzzle next. To get the year we should multiply the four numbers below. Each list is increasing but doesn’t include every number of the specified type. For example the Fibonacci list doesn’t include 13, 21, 34 or 89. 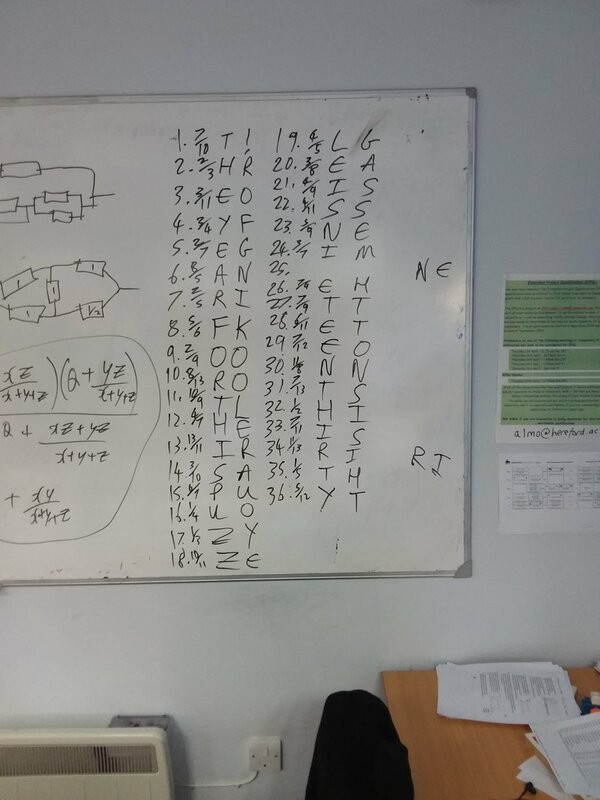 2, 3, 4, 6, 9, 15, 55, 90, 200, 1010 ? Can’t be 90, 200 or 1010 because they give a year which is too big. Lots of factors. 3, 6, 7, 10, 21, 22, 30, 33, 35, 36 It looks like a of things, like Monarchs, States or Presidents. Maybe this sublist have something in common? Presidents are probably out because of Grover Cleveland (he was both 22 and 24). Monarchs who were first of their name? 1, 4, 5, 8, 10, 23, 46, 61, 84, 5000 ? This takes us to inside the front cover. Colouring in between each pair of highlighted letters, we get 2002. The next location is given by taking each letter that the arrows point to: REGEXCROSSWORD. I was definitely overthinking this one. I’m part way through this one. I’m pretty sure the year is 1977 but I’m having to look up a lot of Regular Expressions along the way. Here’s a brief intro. Going through the maze we get GOBACK. T̶h̶a̶t̶ ̶t̶e̶l̶l̶s̶ ̶u̶s̶ ̶t̶h̶a̶t̶ ̶t̶h̶e̶ ̶n̶e̶x̶t̶ ̶p̶u̶z̶z̶l̶e̶ ̶i̶s̶ ̶g̶o̶i̶n̶g̶ ̶t̶o̶ ̶b̶e̶ ̶a̶t̶ ̶t̶h̶e̶ ̶b̶a̶c̶k̶ ̶o̶f̶ ̶t̶h̶e̶ ̶b̶o̶o̶k̶. (I got this wrong. Thanks reddit.) Taking it as an instruction for the puzzle we can try again but starting at FINISH and ending at START. This gives ACENTURY2019, so our year is 2019 and the next puzzle is A Century. There was a problem like this from GCHQ recently and I wrote it up here. Each resistor cluster can be reduced using series and parallel considerations along with the occasional delta-Y transformation (explained on the previous link). This is not the message you are looking for! Which tells us to go to The How to do Ciphers Section. The keyword is: Games Puzzle which confirms that the puzzles in the picture insert are not in order. The third is a poem cipher which will give the year. Working on this. I think each puzzle gives a grid reference to read off the sudoku. This is similar to the front cover in that it has repeated phrases. Highlighting the errors in the same way we get 3 highlighted rectangles. This code is not too dissimilar to the enigma cipher and it gives you the output with the mapping seed and you have to work out the input. One of my students wrote me this piece of code in Python to decode it: google doc link. It gives: “the.puzzle.hunt.continues.the.year.is.mcmxciii” So 1993 and now we have to solve the entire Puzzle Hunt which is made of 10 picture puzzles which come together to form a meta answer.